A dosage of just two or three spoonfuls of Moringa leaves powder provides a substantial amount of most people's iron, calcium, vitamin A, and vitamin C. Especially important – a dosage of Moringa leaves powder delivers food-based nutrients which are proven to have far higher levels of resorption by the body than traditional multi-vitamin pills. This means a moderate daily dose of Moringa leaves powder provides you with a healthy amount of daily nutrients that your body can use with maximum efficiency. Moringa leaves powder can be added to any food or beverage and it will increase the vitamin, mineral and protein content. For healthy individuals, a few spoonfuls of Moringa leaves powder can be added to any meal to make it more nutritious. Since the nutrient content of Moringa leaf powder decreases if exposed to heat, add the powder after the food or drink has been prepared, just before serving. Moringa leaf powder has the greatest impact on those who are more vulnerable: malnourished children, pregnant or lactating women, children at weaning age and the elderly. Malnourished children ages 1-3 years should consume three rounded tablespoons of Moringa leaf powder each day. Pregnant or lactating women should consume six rounded tablespoons of Moringa leaves powder each day. Moringa leaves powder has been clinically proven to increase the production of breast milk whether it is consumed before or after the birth of a baby. Mothers who took Moringa leaves powder were shown to produce more than 2x the amount of breast milk than those who didn't. We all know instinctively that breast milk is the ultimate food prescribed by nature for the infant child and Moringa leaves powder can be instrumental in helping mothers produce more of this precious food. An individual needs sufficient amounts of certain vitamins, minerals, protein and other nutrients to maintain a healthy body and physical well-being. The Moringa leaves powder is an excellent source for many of these nutrients and can be a valuable source for many people. Wash the Moringa leaves in troughs using clean potable water to remove dirt. Wash Moringa leaves again in 1% saline solution for 3-5 minutes to remove microbes. Finally wash th Moringa Leaves again in clean water. The Moringa leaves are now ready for drying. Drain each trough after each wash: fresh Moringa leaves must always be washed with fresh water. Strip all the leaflets from the Moringa leaf petiole. This can be done directly from the branches if the Moringa leaves have not been stripped off the main branch before transportation. At this stage, diseased and damaged Moringa leaves are discarded. Spread the Moringa leaflets thinly on mesh tied on racks (mosquito net mesh can be used) in a well-ventilated room. This room should be insect, rodent and dust proof with good air circulation. It is advisable to turn the Moringa leaves over at least once, with sterile gloves, to improve uniform drying. The Moringa eaves should be completely dry within a maximum of 4 days. The loading density should not exceed 1 kg/m2. Mill dry the Moringa leaves using a stainless steel hammer mill. The Moringa leaves can be pounded in a mortar, or milled with a kitchen blender. Small-scale processors can use a burr mill or rent a commercial hammer mill for routine milling of their products. Moringa leaves can be harvested at any time once trees are established. For Moringa leaves harvest in intensive production plots, plants are trimmed to 15-50cm (6-20in) above the ground. Intensive plots can be trimmed up to 9 times per year. For Moringa leaves harvest in trees, cut the entire tree back to a height of 1-2m (3-6ft); this is best done during the rainy season so that the tree is able to recover before the dry season. Other methods of Moringa leaves harvest for trees include: trimming selected branches (leaving some branches for the next harvest or seed production); trimming each branch back by half; and picking a few leaves off of each branch. Moringa leaves are harvested, they should be stripped off the stems. During this procedure any damaged or discolored leaves can be set aside for animal feed or compost. [Stems and branches can also be used as animal feed or in compost.] Leaves are then rinsed in clean water or a very weak bleach solution (1:100) to remove dirt and germs. Dried Moringa leaves can be made into powder using a mortar & pestle, local grain grinders, burr mills (hand crank or motor driven), or simply by rubbing the dried leaves against a fine screen. Once the dried Moringa leaves have been transformed into a powder, the leaves powder is sifted to remove any remaining stems. 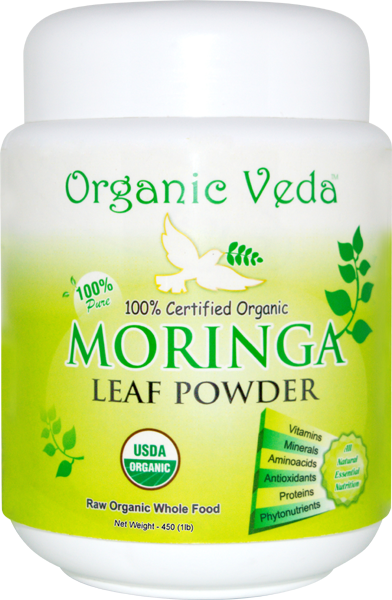 Moringa leaf powder should be stored in air-tight containers protected from heat, humidity and light. If the Moringa leaves powder is not adequately dried or stored it could encourage the growth of molds or mildews which could cause problems ranging from unpleasant to harmful. If stored Moringa leaves powder is exposed to heat or light it will degrade and the nutrient content will be reduced. Moringa leaf powder can be stored for up to 6 months or even longer under the following conditions: clean, dried powder stored in air-tight containers, protected from light and humidity, and kept below 24°C (75 °F). If you use the Moringa leaves powder for tea, you can reuse the moringa powder. Collect the moringa powder after making the tea and for example use it for a milkshake, salad or soup. Increased vegetable utilization and consumption are critical to alleviate world-wide incidence of nutritional deficiencies. Diets rich in micronutrients and antioxidants are strongly recommended to ameliorate the effects of HIV/AIDS. Our survey of over 120 species of tropical and subtropical edible plants for nutrient content, antioxidant activity (AOA), and crop traits indicated that Moringa oleifera is one of the promising crops which could contribute to increased intake of micronutrients and antioxidants. Moringa have been included in the AVRDC Nutrition Seed Kit. Each kit includes different kinds of vegetable seeds for planting in home gardens to ensure good health and nutrition of household recipients. The Nutrition Kit is promoted and distributed by the AVRDC Regional Center for Africa to farmers, women groups, and extension people. Genetic variation, environmental factors, postharvest handling and different means of food preparation influence the nutritional and functional qualities of moringa. The highest nutrient values among four moringa species evaluated were measured on Moringa oleifera. AVRDC designed methods for high density planting and pruning enabled convenient and continuous harvests of young shoots for fresh market. We found that harvest season and leaf stage significantly influenced nutrient contents of Moringa leaves. Higher protein, vitamin A and glucosinolates contents and AOA were obtained in hot-wet season; whereas, higher iron, vitamin C, and phenolic contents were found in cool-dry season. Variation among 10 Moringa oleifera accessions for nutrient contents were small and thus varietal selection should focus on horticulture traits. Mature leaves were more nutritious than young shoots and could be quickly dried with minimum nutrient loss; however, young shoots exhibited better eating quality and thus were better accepted for fresh market. Cooking increased availability of iron and enhanced aqueous AOA. The AOA was maintained after simulated digestion. Moringa leaf extracts exhibited anti-microbial activity including inhibition of the growth of Staphylococcus aureus strains isolated from food and animal intestines. Moringa added to fodder could be a potential bioceutical agent to substitute for antibiotics in livestock production. For human use, intervention with a diet containing 5% moringa powder was investigated using a rat model and compared to a 5% common cabbage diet, and a nutrient-sufficient diet without vegetable. The study implies the consumption of Moringa leaves powder enhances the immune response of nutrient sufficient subjects. In addition, consumption of nutrient and phytochemical-rich vegetables, like Moringa, leads to a better immune response compared to consumption of vegetables that are rich in fiber but lower in nutrient content, like common cabbage. Moringa leaves powder should be promoted for greater consumption to improve nutrition and strengthen immune functions for fighting infectious diseases. Iron and vitamin A deficiencies, and infectious diseases continue to devastate people of the developing world; non-communicable diseases attributable to obesity are increasingly common in developed and developing countries. Diets rich in vegetables and fruits providing micronutrients and health-promoting phytochemicals could alleviate both under-nutrition and obesity. Most people in the world lack adequate access to vegetables even though they are essential for good health. Insufficient vegetable and fruit consumption causes 2.7 million deaths annually worldwide and belongs to the top 10 risk factors contributing to mortality (Ezzati et al., 2002). Malnutrition is rampant in the tropics where per capita vegetable supplies in most countries falls far short of the minimum recommended 73 kg/person/year. In Sub-Saharan Africa, per capita vegetable supplies are only 43% of what are needed, leading to widespread malnutrition. There are hundreds of plant species consumed as vegetables, but only about 20 crops are produced in intensive cropping systems (Siemonsma and Piluek, 1994). Indigenous vegetables (IVs) are native to a particular region or introduced to the region from another geographical area over a long period of time. They are grown locally in a small scale, often resistant to diseases and tolerant to environmental stresses, very nutritious and contain a vast range of phytochemicals; however, most are neglected or under-utilized. IVs have potential for introduction or greater use as cash crops in peri-urban systems, vegetables for daily sustenance in home gardens, and a means to diversify production systems and diets. Nutrient contents of vegetables vary greatly. Among 240 edible plants of 120 species tested at the AVRDC, β-carotene content were measured and ranged 0 − 22 mg with the average of 3.1 ± 3.3 mg based on 100 g fresh weight (fw) basis. Iron content ranged 0.2 − 26 mg/100g fw and averaged 2.1 ± 2.6 mg/100g fw. Vegetable sample distributions for β-carotene and iron contents were screwed with the majority of samples ≤ 4 mg/100g for β-carotene and ≤ 2 mg/100g for iron. With the survey of 120 edible plant species, Moringa oleifera were found among the most promising species according to their high antioxidant activity, high contents of micronutrients and phytochemicals, processing properties, ease of growing and palatability. In this paper, we present nutritional and bioactive values of moringa leaves from germplasm, to field, to plate and to health outcome. We compared antioxidant and nutritional values of four Moringa species (Yang et al., 2006). Moringa stenopetala is the most economically important species after Moringa oleifera among Moringas; Moringa drouhardii has the most pungent odor similar to mustard oil; and Moringa peregrine has the widest habitat range and the only one of the slender trees extended out of Asia (Olson, 2001). Among the four species, Moringa oleifera contained the highest amounts of β-carotene, ascorbate (Vit C), α-tocopherol (Vit E) and iron, and was the second highest in protein content (Table 2). Moringa oleifera grows faster than the other three species under the subtropical low lands in Taiwan, and this specie is commonly consumed as a vegetable in South Asia and Africa. Oligosaccharides and oxalate were reported as anti-nutrient factors in Moringa leaves (Freiberger et al., 1998). In this study, stachyose and raffinose were not found in mature leaves, but detected in young leaves (0− 14 mg/g dry weight) and in seeds (22−98 mg/g dw). Moringa mature leaves contained very low value of oxalate (0.99 ± 0.21 mg/g dw) by compared to spinach (25−45 mg/g dw). The data indicated that oxalate and oligosaccharides are not significant anti-nutrient factors in Moringa. Concentrations of four natural antioxidants (total phenolics and antioxidant vitamins A, C and E) were measured for the four species. The content ranges on a dry weight basis were 74−210 µmol/g for phenolics, 70−100 µmol/g for ascorbate (Vit C), 1.1−2.8 µmol/g for β-carotene and 0.7 − 1.1 µmol/g for α-tocopherol (Vit E). Antioxidant content of Moringas are high even compared to vegetables and fruits known for high antioxidant contents such as strawberries high in phenolics (330 mg gallic acid (GA)/100g fw, or ~190 µmol GA/g dw); hot pepper high in ascorbate (200 mg/100g fw, or ~110 µmol/g dw), carrot high in β-carotene (10 mg/100g fw, or ~1.8 µmol/g dw) and soybean which is high in α-tocopherol (0.85 mg/100g fw, or ~1.8 µmol/g dw). Moringas are an excellent source of a wide spectrum of dietary antioxidants. In summary: (1) high nutrients, antioxidants and glucosinolates, and low oxalate contents are common features of the four Moringa species; and (2) Moringa peregrina was the uppermost for antioxidant; Moringa oleifera has the highest nutrient values among the four. Ten Moringa oleifera accessions, selected from a survey of 60 Moringa oleifera accessions for yield and growth performance, were used in the study. The seeds, collected from Taiwan, Phillipines, India, USA and Tanzania, were sown on 30 March 2004, and transplanted to the field on 26 April 2004. Plants were grown on 6-m-long x 1.5-m-wide x 30-cm-high raised beds, in double rows with 30 cm between rows and plants within rows. Accessions were arranged in a RCBD with 40 plants per plot and 3 replications. No pesticide was applied. Plots were harvested for young shoots 1-2 times per week from three harvest periods: 30 June − 7 December 2004, 24 Jan − 30 March 2005, and 25 April − 15 December 2005 with about one month interval of each harvesting period to allow mature leaves growth. The average air temperatures and rain falls were 29.2°C (23.9 − 34.6°C) and 13.9 mm in June 2004 as hot-wet season, 17.7°C (6.7−27.4°C) and 0.1 mm in January 2005 as cool-dry season, and 24.7°C (15.4−32.8°C) and 1.1 mm in April 2005. Young shoots and mature leaves were collected separately from the branches harvested the first day of the three harvest periods and sent to laboratory. Nutrient contents and antioxidants were measured. The averaged values are shown in Table 3. Seasonal effects caused 1.5-3 times content variation for vitamin A, iron and antioxidants in moringa leaves; higher vitamin A was obtained in hot-wet season while higher iron and vitamin C were found in cool-dry. Leafy vegetables are often cooked before consumption and dried in preservation during time of scarcity of vegetables. Sun-drying in direct sunshine and under shade are the common practices used in most parts of Africa to preserve vegetables for dry season consumption (Lyimo et al., 1991). However ways of food preparation and preservation may affect significantly the concentration and availability of minerals, vitamins and other essential compounds in food. Some reports have documented the losses of nutrients from vegetables during drying (Yadav and Sehgal, 1997) and cooking (Kachik et al., 1992 and Kidmose et al., 2005). A low temperature oven drying process was applied to dehydrate moringa leaves. The nutrient values were measured and compared to those of freeze dried leaves.The results sowed that drying at 50°C for 16 hours maintained most nutrients and phytochemicals in moringa leaves except for vitamin C. The mild-heating and drying process could be achieved using common household facility such as stove to provide a simple and effective way for long term preservation and continuous supply of essential micronutrients. Our previous study on in vitro iron bioavailability (IB) of vegetables indicated that cooking increases IB of certain vegetables 2−10 times (Yang et al., 2002). The cooking enhancing effect can be achieved with different heating processes including boiling, stir-frying and hot-air drying. Prolonged storage of cooked vegetables will reduce the availability of iron. In the case of cabbage, the cooking enhancing effect was due to the reduction of iron-polyphenol interaction, which commonly occurs during plant cell destruction. The nature of the enhancing factors in these vegetables was similar to the effect of EDTA, which stabilizes iron when it is released from cell (Yang and Tsou, 2006). In he case of Moringa, boiling in water enhanced the in vitro IB of fresh leaves and dried powder by 3.5 and 3 times, respectively. Cooking Moringa leaves also raised total available iron of mixtures with other food items such as mungbean (Yang et al., 2006). In addition, boiling Moringa leaves in water enhanced aqueous AOA, and the AOA was maintained after simulated digestion. Intervention with a diet containing 5% Moringa leaves powder was investigated using a rat model and compared to a 5% common cabbage diet, and a nutrient-sufficient diet without vegetable. After 3 weeks, the preliminary result (data not shown) indicated that the Moringa leaves powder diet lightly reduced blood triglycerides and enhanced immune response due to increased peripheral and splenocyte T-cell proliferations. The preliminary study implies the consumption of moringa leaves powder may increase immune response of nutrient-sufficient subjects. In addition, consumption of nutrient and phytochemical-rich vegetables, like moringa, leads to a better immune response compared to consumption of vegetables that are rich in fiber but lower in nutrient or phytochemical content, like common cabbage. Moringa should be promoted for greater consumption for human use to improve nutrition and strengthen immune functions. High nutrients, antioxidants and glucosinolates are common features of Moringa species. However, leaf stages and harvesting seasons can change their nutritional values 1.5 − 3 times, especially for β-carotene and iron. Variation among Moringa oleifera accessions for nutrient contents were small, varietal selection should focus on horticulture traits. Cooked moringa leaves provide more bio-available iron. Mild-heat drying process (50 °C/ 16 hours) maintained most nutrients and bioactives in moringa leaves and could be achieved by low-cost household preparation as a simple and effective way for continuous nutrients/bioactives supply. The Moringa leaves powder provide many kinds and types of nutrients and bioactives, which would lead to better nutrition and health.